Installing a new air conditioning unit is a huge investment, and not everyone can afford to pay it outright. Fortunately, there are reputable HVAC companies like A-1 Heat and Air Conditioning offering financing options to back you up during emergency needs. Have you ever thought of what makes financing your newly-installed A/C unit a good idea? Here are a few amazing reasons why financing is a smart choice. In financing your new A/C in Central Florida, you have three common payment options: credit card, home equity plan, and contractor financing. Your contractor or manufacturer will discuss with you each of these options and will help you find the best choice. If you are thinking of installing a new air conditioning unit, the first thing to do is to look for a reliable HVAC contractor. Make sure to find the right one to invest your money. Does financing your A/C save you from unexpected repairs and expenses? Definitely! Funding your new A/C comes with other surprising benefits like a regular preventive maintenance plan. With this, you can determine and fix any issues with your unit before they become major problems. Preventive maintenance of your air conditioner can save you from unforeseen expenses. Applying for a financing option for your new air conditioner gives you a priority access to all services. Depending on the HVAC company you are working with, you can get a priority card for every transaction made. Therefore, you do not have to wait for hours or days before your problem is noticed. You can ask for help immediately and get response automatically. You are lucky to find a heating and cooling company that offers a financing opportunity for your air conditioner along with discounts and freebies. Your application for a financing option comes with great discounts on installation, maintenance, and other amenities. As a result, you can save as much money as you want. If you are planning to sell your home in the coming years, having a new air conditioning unit installed is a good selling point. Thus, if you take advantage of financing today, you will get extra benefits in the future. Get these exciting benefits by financing your new HVAC system as early as now. 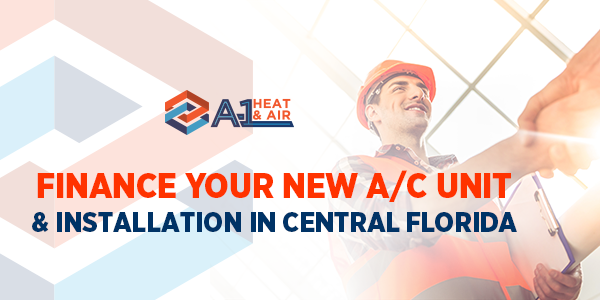 At A-1 Heat and Air Conditioning, we will help you find the best financing option that suits your residential needs in Central Florida. Call our customer service team for details.